It’s been a couple of years since I have written a blog post on the YLS Cost of Living survey and felt it was time to re-address what it is we actually do with this survey data and why it’s critical to the financial aid process. And along the way I will share some of the specific results of the recently completed 2014-2015 survey. WHAT DOES ANY OF THIS HAVE TO DO WITH FINANCIAL AID? In order to award aid (by federal regulations) we must annually develop a “Cost of Attendance” (i.e. budget) which represents both the fixed (think tuition and fees) and estimated (i.e. books, housing, food) costs that a student attending YLS would incur. . That Cost of Attendance forms that basis of all aid awards since the need based aid formula is Cost of Attendance – Contribution (student, parent etc.) = Need. So to come up with those estimated costs of books, housing, food etc. we go (through the survey) to the people actually incurring these costs- our students- . WHY FOCUS THE SURVEY ON ONLY CERTAIN EXPENSES? – The Department of Education regulations specify what are “allowable” expenses in the Cost of Attendance and it’s usually a pretty narrow definition. They also mandate that the same Cost of Attendance must be used for all students in the same degree program So we can’t create budgets based on each individual student’s spending pattern or needs… everyone is held to same overall Cost of Attendance accountability. THE “BONUS”- beyond helping us build the Cost of Attendance, the survey gives us information to evaluate financial challenges among our students, which we can then address. . For example the increasing cost of professional clothing in last year’s survey led to our “Dress For Success For Less Workshop” this past year, as well as our increasing the COAP eligible suit loan from $350–$600. So the pragmatist in me says it makes sense that people want to live in downtown as close to YLS as possible. But the Financial Aid Director in me looks at that same data and worries about the “price” of that convenience given that Downtown rents are notoriously higher priced. For the first time (in the 5 years that I have been conducting the survey) – the percentage of 1Ls living with roommates surpassed the number of 1Ls living alone. To me that’s a very positive trend because there are huge cost savings in living with roommates (and even more if you can do it for all three years). How much savings? Let’s do the math – that cost difference between living with a roommate (let alone two or more roommates) is $3,978 for the 9 month academic year. If you lived alone for all three years that’s $11,394. Think that’s a lot? How about if you had to borrow that amount in extra Grad Plus loan funds and then pay it back on a 10 year repayment- total cost then for wanting to live alone for your three years of law school is now – $16,230? 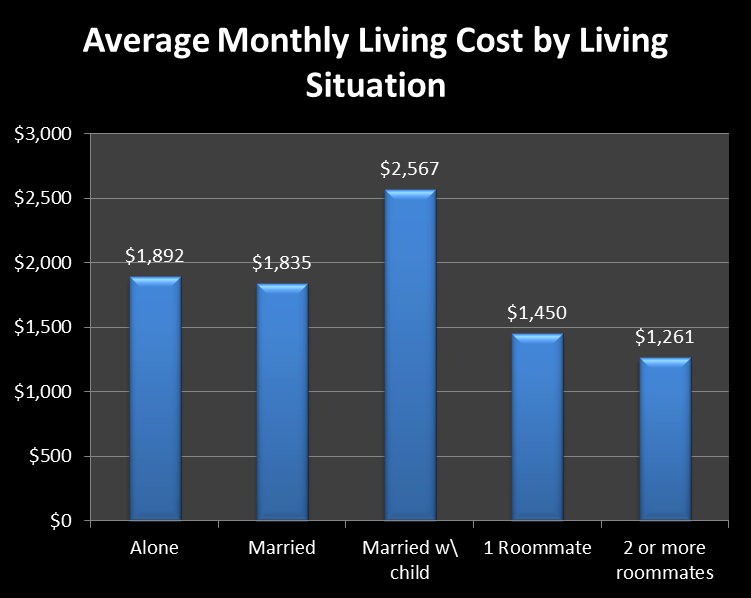 The Average Monthly Living Cost decreased from 13-14 (primarily due to a drop in the average rent/housing cost) and given that data it’s awfully hard to justify an increase to the present $17,000 allotted for living in the student budget. In addition, the present estimate of $1,100 for books is fairly accurate given that the survey showed 2Ls and 3Ls spending an average of $954 last academic year. There were some “ongoing” expenses cited for which we can make budget adjustments and allow additional COAP eligible loan borrowing- professional clothing, travel for Clerkship interviews and computer purchases. I worry from the responses that not everyone knew this option was available to them. Many people cited out of pocket health costs as a challenge. Per federal regulations this is an area where on an individual case by case basis we can potentially make a budget adjustment for additional loan funds (however not COAP eligible) but in a cash flow situation that might help you deal with these costs. If this is your situation, come talk to us. 57% of you indicated that you keep a budget!!! That’s the key to this whole Cost of Attendance challenge. 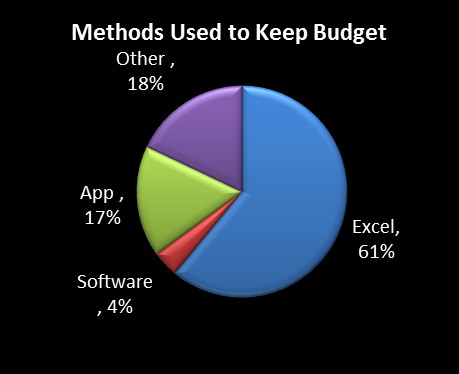 And interestingly most of you are keeping it on a basic Excel spreadsheet and if using an app or software the majority are using mint.com If you are not keeping a budget you may want to check out the basic excel budget template we have available on the Inside Page. THE BOTTOM LINE: As with all things financial- we have to end with the bottom line… we will retain the $17,000 allowance for “living” and $1,100 allowance for “books” in next year’s 2015-2016 Cost Of Attendance because based on the survey data (which is the only empirical evidence we have) an increase is not justified. That $17,000 allowance is still above the $14,679 average academic year living costs calculated by the survey and, as such ,we are still allowing a $2,321 “buffer” for higher cost choices or to cover some of the ancillary costs. (toiletries, household expenses, entertainment, technology maintenance, pet care, etc.) cited as ongoing expenses in the survey. We also need to point out that increasing the “living allowance and Cost of Attendance in general also increases the amount of unit loans offered to you and your overall borrowing/debt. 2) Don’t hesitate to come to the Financial Aid Office to discuss any of the financial challenges that you face. There are circumstances under which we can make aid adjustment and, at the very least, we may be able to offer support and help you come up with some creative solutions. Turning the calendar page to January (seriously does anyone even have a paper wall calendar anymore?) is the perfect time to think about getting your credit report. (Huh?) Because you are entitled to a free credit report once a year and why not use January 1 as your own annual reminder. Thinking that you don’t really need to worry about your credit score until after you graduate? Think again… that federal Grad Plus loan that you may have opted to borrow is reviewed for credit eligibility each year. So that means that a small credit slip (late bill etc. ) in your 1L year could make you ineligible for the Grad Plus for your 2L year. Are you considering taking out a Bar Loan to help support your living expenses while studying for the bar? Bar loans are only offered by private lenders and all are credit based -not just for their overall approval but also in determining what your interest rate will actually be. (i.e. good credit = low interest rate and bad credit = high rate). 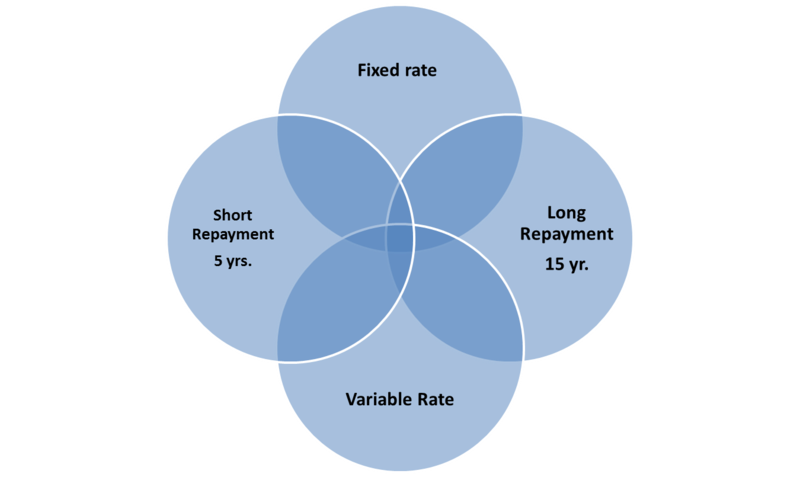 Want to take advantage of the new refinancing options on your student loans that so many lenders are new offering- those interest rates are credit based as well. Even potential employers will review and factor your credit into the hiring decision. Order the report from all three companies at the same time so that you can determine whether any of our files have errors across all three agencies. Request the reports separately for each credit reporting agency at various intervals so that you can monitor your credit files more often throughout the year. No matter if you want the report from Equifax or TransUnion or Experion- you order it from one place- www.annualcreditreport.com. That URL is the only one that will provide the report for free. (You may have seen ads for other sites with names that make you think the credit report is free but it is not). What will your find on the credit report? Basically the report contains information about your credit accounts including how much credit you have vs. how much credit is available to you vs. how much credit you are actually using. There will also be information on your bill repayment history and whether a debt or bill collection is in place against you. What won’t you find on the report? Well surprisingly you won’t find an actual “credit score” You will need to purchase a credit score directly from the credit reporting companies. But since that score is based on all the information from the credit report it is still incredibly valuable to review the report and make sure there are no inaccuracies or errors which can hurt the calculation of the credit score. What do you do if you find something wrong on the report? Fix it asap so that it doesn’t harm your credit in the long term. To correct an error reach out directly to the credit reporting company and fill out one of their dispute forms. Know that the agency must investigate and respond to you within 30 days. Does asking for the report itself “ding” your credit? No, self-inquiries do not affect your score, as long as you order your credit report directly from the credit reporting agencies, or through an organization authorized to provide credit reports to consumers (like annualcreditreport.com)! So start the New Year right – begin by getting a copy of your credit report atwww.annualcreditreport.com. You may need that good credit in the not so distant future! It seems like I am forever preaching the gospel of eating on the cheap at YLS . By now I am sure everyone knows that “food” is the one discretionary item in your budget that you can control (because you can’t really change how much you are going to pay each month for rent and utilities.) You probably also have heard me quote a very wise YLS student who once shared the prophecy- “ buying meals out is one of the most efficient ways to deplete your budget” . Well there is a great new resource making its way through the graduate school world – “Good and Cheap: Eat Well On $4/Day” by Leanne Brown. Leanne actually wrote “Good and Cheap” as part of her master’s in food studies at New York University. The original premise of her study was focused on the critical question “how well can a person eat on the $4.00 per day given by SNAP (the U.S. Supplemental Nutritional Assistance Program – aka Food Stamps)? . Leanne proved that based on maximizing every ingredient and using economical cooking methods there are numerous nutritious and affordable options. Her upcoming book (self-published as a result of a successful Kick Starter campaign where for every book funded a copy would be donated to a non-profit organization) not only includes a wealth of her nutritious budget conscious recipes but also includes tips on shopping, creating a basic pantry, and mastering some essential staples (i.e. pizza dough, flour tortillas, even croutons!). Now the book won’t officially “drop” until June 2015 but in advance of that you can visit Leanne’s website where she encourages downloading a PDF version so you can start cooking meals that are healthy for your body and budget. So this is my one (and most likely only) chance to join the myriad of “fashion bloggers” out there. Definitely a bucket list item I can now cross off. So what’s the connection between my real life world of financial aid and the far more interesting world of fashion… budgeting of course (my favorite topic of conversation). Our 2013-2014 Cost Of Living Survey indicated that on average, YLS students spent $642 on professional clothing last academic year (a significant jump of 18% over what was spent the prior year). That’s a big bite out of the already stretched student budget. But the reality is that you can indeed “dress for success… for less” as our October 20th Financial Literacy Lunch Workshop proved. Fashion editor Shanelle Rein Olowokere (In Style, Entertainment Weekly, People Style Watch, PEOPLE.com and currently senior fashion editor at Goodhousekeeping.com) brought her fashion sense and sensibility to YLS. 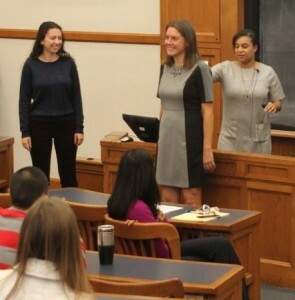 Shanelle recognized that YLS students face two distinct challenges- dressing for the nonprofit/public service work environment and dressing for the far more conservative and formal law firm setting. With clothing generously provided by THE LOFT, Shanelle used real YLS models to demonstrate two looks for both the conservative (think firm or clerkship) to casual (nonprofits or new media) work places. Our special thanks to our two models Chelsea Lane-Miller’ 17 and Irina Anta’ 15 for agreeing to walk our makeshift runway (well, okay just the amphitheater stairs in Room 127) . 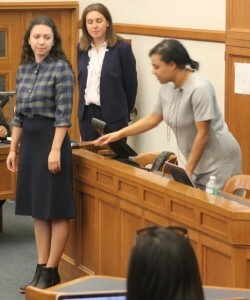 In the photo on the left, Shanelle (right) highlights some of the features on Irina’s “casual work environment” LOFT look , while Chelsea (middle) waits to show a LOFT suit appropriate for “firm wear”. And Shanelle didn’t forget the men- she included in her presentations visuals for optimum casual and conservative looks for them as well. 1) The absolute need to find the right fit- whether that means ignoring the sizing label, making friends with your local tailor or just knowing your body enough to realize what looks right on you! 3) Work those accessories- want to express your individual style while wearing a relatively conservative wardrobe? Let your accessories (tie, scarf etc.) do the talking for you. But don’t forget that you want quality in those accessories so that they fit well and will last … whether in good (aka comfortable) shoes or leather handbags . Beyond her basic presentation, Shanelle fielded a lively Q&A session with students that touched on every fashion aspect imaginable from appropriate winter outerwear (answer- classic trench coat and wool coat), whether you can wear black shoes with navy pants (answer- absolutely), if black flat shoes are appropriate (answer- depending on the work environment and if the shoe was constructed well i.e. no ballet shoes), how to work with a tailor (answer- start with alterations to some of your less expensive clothing to see if you like their work before giving them any of your higher quality suits or dresses) to whether you can use a nice leather tote bag in lieu of a purse (answer- yes!) . Above all Shanelle emphasized how important clothes are to not just looking professional but feeling good about yourself in the workplace, which ultimately help your performance. And she gave tips galore on inexpensive brands, sale strategies (shopstyle.com!) and continually proved that you can indeed dress well on a budget (provided you make a budget!). And so ends this post from the self-proclaimed “Financial Aid Fashionista”! I Have An Aid Award…. Now What? 1) Send the required tax documentation. We will actually compare your prior year 1040 tax return to the information you provided on Need Access upon which the preliminary award was made. If there is a substantial difference between the two an aid award adjustment (either increase or decrease ) may be made. Remember you need to file tax documentation for anyone whose data you reported on Need Access (including spouse or parent(s) if you are under age 29 by 12/31 of the year for which you are seeking aid). Weren’t required to file a tax return? Then you need to complete a “Non Filer” Statement on the Forms section of our website. Big requests … please only send the first two pages of the 1040 return . Our office printers and fax machines have died slow and painful deaths printing out tax returns that include multiple pages of Schedules. Save some trees, save our office machines… only send the first two pages. If we need any of those additional forms for further clarification.. .we will let you know at the appropriate time. Final step on the tax returns … by federal aid regulations they must be signed preferably on page 2 of the 1040 where it says “ Sign Here” (you would be surprised how many people miss that). Electronic or scanned signatures are totally acceptable. And if you e-filed your returns just sign anywhere on the copy you are sending us. If you have decided to borrow additional loan funds to cover the calculated parent contribution you would simply add that additional borrowing to your Grad Plus loan . You can never increase the Direct loan above the $20,500 federal limit. International students should just increase their Yale Graduate and Professional International loan for any parent contribution borrowing. Think about how much you truly need to borrow- do you really need the full amount of loan funds offered? Can you budget for less than the $17,000 living allowance to decrease borrowing? Even a few dollars less in borrowing can save you considerable money in ultimate loan repayment. Also know that if you do decline any portion of your loans now… at any point during the academic year you can re-accept those funds . We have to know how much aid you are accepting so that those funds appear as “ anticipated aid” and will against the direct Yale charges of tuition and fees on your soon to be issued (July 1) Fall term bill. Equally important… receipt of the Notification and Confirmation Form is our indicator that your file is ready for a final review. Submitting the taxes alone will not trigger that process . Is there more to the financial aid process? Oh yes. Between now and the end of the summer, financial aid requirements including loan master promissory notes , online entrance counseling, asset verification forms, refund requests will all come into play. All to insure that when you do arrive on campus the bill is paid and you have funds in hand to support your living expenses. But that’s info for another blog at another time. For now just focus on finalizing the aid award. For more information on the aid award process with links to the tax return and Notification and Confirmation Form requirements visit our website.